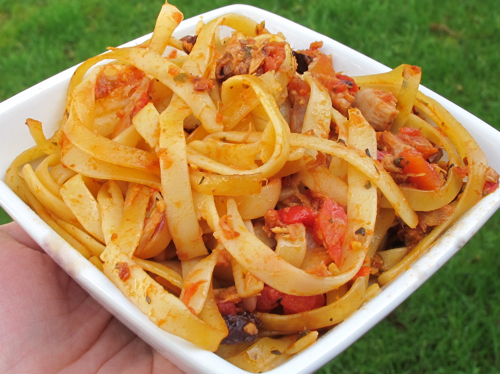 I had a craving for spicy pasta last night and this was fantastic, just what I was carving. Do use tuna packed in oil even though you might be thinking of water packed. It simply tastes so much better and doesn’t have a ‘tuna smell’ in meals! You can though cut back on the tuna and only use one can if so desired. Most grocery stores have a couple of varieties to choose from, try to find one packed in extra virgin olive oil. The cheaper varieties are packed in soybean oil with vegetable broth and are so not worth it! And while linguine is traditionally used, I went with fettuccine pasta instead. The thinner texture is something I like. Anyhow, use whatever pasta you prefer! Bring a large pot of water to a boil, cook pasta for time on package (mine was 13 minutes). Meanwhile in a large non-stick skillet heat the oil over medium heat. Add in the garlic and red pepper flakes, stirring often until golden and smelling good. Add in the capers and olives, continue cooking for a minute or two more. Add in the tomatoes and basil, open up the tun and flake in (with the oil). Bring to a gentle simmer and turn down to low while the pasta finishes cooking. Drain the pasta and add to the sauce. Take off the heat and toss till the sauce coats.